Trending at $46.30eBay determines this price through a machine learned model of the product's sale prices within the last 90 days. Interface: NGFF(M.2). 1 NGFF SSD. Bring you great convenience with better performance. The SSD is no doubt a best choice for your tablet and computer. Flash type: MLC/NAND flash. Increased energy efficiency to keep you doing what you love. 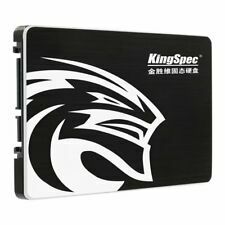 KingSpec SSD 256GB 2.5" Hard Drive SATA3 Internal Solid State Drive HD P3-256. Condition is New. Shipped with USPS First Class Package. Model P3-512 3D MLC 480GB SSD. Performance Capacity 120GB | 240GB | 480GB. General Form factor 2.5". Mk8025gal mk1214gah mk1634gal. 1.8" Half Size 128GB KingSpec MLC ZIF SSD. Model ZIF 1.8" MLC. Performance Capacity 128GB. For the ultimate computing experience, upgrade your system with the powerful KingSpec solid state drive. Model MLC 512GB SSD. Performance Capacity 512GB. General Form factor 2.5". ETA 3 to 6 Weeks. 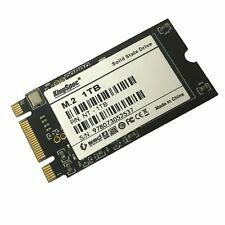 M.2 2242, SATA 6 GB/s, MLC, 256GB. ECC (Error Correction Code): Supports BCH 8/16/24/40 bits ECC. Up to 550MB/s and 400MB/s read and write speeds. 1 x 1.8" KingSpec 128GB MicroSATA SSD. Interface: MicroSATA. Replacing your hard disk drive with the KingSpec® Solid-State Drive will revolutionize your computing experience. Capacity: 128GB. Performance Capacity 8GB | 16GB | 32GB | 64GB |128GB. What you see in the pictures is exactly what you will be receiving. Replacing your hard disk drive with the KingSpec® Solid-State Drive will revolutionize your computing experience. Interface: PATA / IDE, 44pin. 1 x 2.5" KingSpec 128GB PATA IDE SSD. Capacity: 128GB. Model PATA 2.5 MLC. 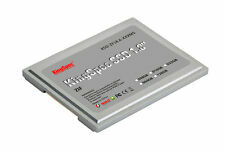 KingSpec Solid State Drive 2.5 SataIII 512GB, 3 years warranty void if any Label/ Screw is REMOVED or BROKEN Made in China. 1 128GB SSD like the as real picture. Q. Will the capacity of the SSD be exactly 128gb?. Q. Why can't I find the SSD Read / Write Data?. Interface: SATA III. Increased energy efficiency to keep you doing what you love. The features of SSD. Low power consumption, no noise, small size. Low power consumption. Warranty: all our product are new from the factory. Flash: MLC. Interface: NGFF(M.2). 1 NGFF SSD. Capacity: 128GB. Flash type: MLC/NAND flash. Max speed: read speed 470~520MB/s, write speed 380~440MB/s. Channel: 4. Working temperature: -0℃～70℃. MTBF (hours): >1 million hours. KingSpec's NGFF SSD (Solid State Drive) is a high performance and high reliability storage device based on NAND Flash technology that designed to solve the bottleneck of computing system by traditional hard disk drives. Reading and writing speed. ETA 3 to 6 Weeks. Condition is New. This is a great speed SSD Drive. This is a great speed SSD Driver. CE RoHS KC ISO9001. NAND flash. Sequential Read/Write. Model IDE 44PIN DOM Vertical Socket MLC. Interface 44PIN IDE. Performance Capacity 1GB | 2GB | 4GB | 8GB | 16GB | 32GB. Data Retention 10years at 25ºC. Weight(g) 9±2. Length(mm) 50.7±0.15. Width(mm) 6.7±0.1. Performance Capacity 1TB. Interface SATA III, downward compatible with SATAII. Flash NAND MLC. Testing tool Crystal DiskMark3_0_0. Free power 0.5W. Working power 1.5W. ETA 3 to 6 Weeks. ATTO Disk Benchmarks V2.47_CN. Capacity: 128GB, 256GB, 512GB, 1TB (optional). Bring you great convenience with better performance. The SSD is no doubt a best choice for your tablet and computer. Support Capacity: 512GB, 1TB, 2TB;. This can also be used in NGFF SSD to 2.5" enclosures, or PCI-E adapters for desktop use if you do not have an available M.2 slot, perfect for older desktop PC motherboards! 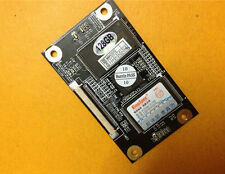 Benchmark taken is with this SSD card installed in a M.2 NGFF to Sata III enclosure. Replacing your hard disk drive with the KingSpec® Solid-State Drive will revolutionize your computing experience. 1 x 2.5" KingSpec 240GB SATA 3 MLC SSD. Capacity: 240GB. Performance Capacity 60GB | 120GB |240GB| 480GB. Model Number: SSD 500GB 512GB 1TB 2TB. Model Type: 2.5" SATA SSD 512GB 1TB 2TB. Type: 2.5" SATA SSD Hard Drive. Style: SSD. Interface Type: SATA SATAIII. Read/Write Speed: 450~500MB/S,350~450MB/S(for reference only). Replacing your hard disk drive with the KingSpec® Solid-State Drive will revolutionize your computing experience. 1 x 2.5" KingSpec 480GB SATA 3 MLC SSD. Capacity: 480GB. Performance Capacity 60GB | 120GB | 240GB |480GB. Interface: MSATA. 1 MSATA SSD. Bring you great convenience with better performance. The SSD is no doubt a best choice for your tablet and computer. Increased energy efficiency to keep you doing what you love. WD WD307BB. WD WD307AA. WD WD300EB. WD WD300BB. WD WD300AB. WD WD300AA. WD WD205BA. WD WD205AA. Flash type: MLC(multi leveled cell). Bring you great convenience with better performance. The SSD is no doubt a best choice for your tablet and computer. 1 32GB SSD. Capacity: 32GB. Compatible for Windows XP, for Windows 7, for Windows 2003, for Windows 2008, DOS, for Linux, Unix system. BETA LA-Tronics - Kingspec 2.5" 128GB PATA/IDE SSD Solid State Disk Drive KSD-PA25.6-XXXSS. Condition: Item has been tested and is fully functional. Item is in grade "A" condition. Also, we do not have a price matching policy. 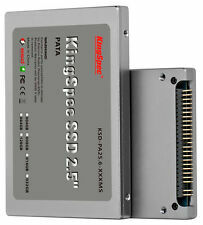 KingSpec 32GB horizontal 44 pin IDE DOM/flash module/SSD. Flash type: MLC(multi leveled cell). Capacity: 64GB. Interface: SATA III. Channel: 4. Compatible for Windows XP, for Windows 7, for Windows 2003, for Windows 2008, DOS, for Linux, Unix system. MLC technology 64GB SSD. Sata III interface. Bulk ordered for small projects and have excess that will go unused.